Glynhir Golf Club is a mature parkland course 3 miles from the town centre of Ammanford and 5 miles from the old market town of Llandielo, near to the beautiful Brecon Beacons National Park. It is surrounded by fine countryside with beautiful views and is bordered on two sides by the Rivers Lougher. Accommodation is available locally at "The Mill Glynhir", and at "The Glynhir Mansion", with additional facilities at the nearby Llandielo and Llandovery towns. We offer a special Golf Package for visitors and Society Groups. This consists of 2 rounds of golf with 2 nights accomodation with Bed and Breakfast with evening Dinner at the Mill Hotel at an attractive price of £129-00. 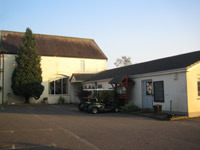 The golf course has a covered practice area, a well stocked shop, the changing rooms and showers are available for use by visitors. Other Local attractions include : The National Botanical Garden of Wales (15 mins), Aberglasney (10 mins), Carreg Cennen Castle (10 mins), and the Gower Coastline is only a 40 minutes drive. 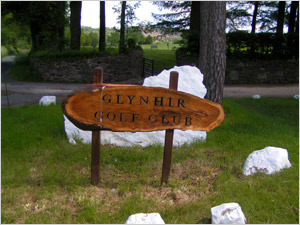 Glynhir is a course that will suit Golfers of all abilities and challenge both the accomplished player and the novice. Off the white tees, Glynhir is a stiffer challenge that its length suggests. The first, a medium length par 4, all downhill, but watch out for the bunkers at either side of the green. The Sixth, a Par 3 with its narrow exit from the tee opening out to the only pond on the course, spoils many a card. The fourteenth, acclaimed by many as the perfect dog leg will need an accurate tee shot to open out the green. During the summer months all greens are fast and with some interesting pin positions can make even the best putters think about hidden borrows. Few visitors manage to break 70 on their first visit. A warm welcome awaits the golfer in the well stocked clubhouse, where individuals, groups or cooperate parties can choose from a selection of food and drink served throughout the day. Packages available for larger groups or societies, by prior arrangements with the Professional or club secretaries. The Pro Shop is here to help all Visitors and Members to enjoy their time at Glynhir Golf Club. Feel free to pop in and see our Club Professional Richard Herbert who will help you enjoy your day. 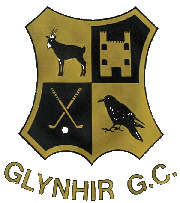 Glynhir Golf Shop offers a friendly welcome and pleasant atmosphere with the knowledgeable staff who are always ready to help. A fully stocked shop with a wide range of many well known golf brands and in addition we provide the facility of " if we don't have it in stock we can get it". Glynhir's four bay covered range allows professional tuition and practice all the year round. Lessons are available for golfers of all standards. ( Individual, Junior Group Coaching, Clinics and On Course). Vouchers for lessons provide a perfect gift.